Dr. Dad and I have a lot of books. I have two full bookcases for novels. Dr. Dad's interests run more toward science, politics, and Bible references. IntelliGent has grown up with books all around him. I remember the day he took an interest. IntelliGent was a late walker (more on that in another post). It took him forever to pull himself up on furniture, but when he did his favorite place to stand was next to the bookcases. He'd pull books out, flip through the pages, and then put them back. His favorite books were Dr. Dad's Old Testament Bible commentaries. We learned early that IntelliGent was very careful with books. The only page he has ever ripped was when we, as parents, over reacted. As long as we remained calm, the pages were gently turned and the books put back in their places. Sure, they were sometimes backwards or upside down, but the books were treated well. Then came the day IntelliGent asked me to read the exhaustive concordance of Bible words to him. Gently I explained that the book wasn't a story and that he could look at the book once he learned how to read. That moment sparked a almost obsessive fascination with letters. IntelliGent started paying closer attention to his ABC books, and when he began telling me the names of the letters on the page, I knew it was time to feed this new passion. 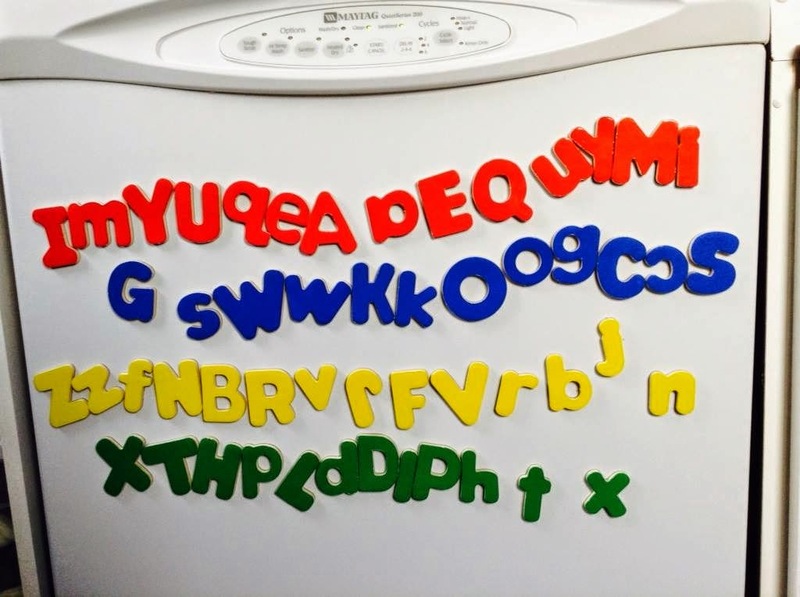 We purchased Melissa & Doug ABC puzzles and magnetic letters as well as other resources to help aid in his letter discovery. I love the quality of Melissa & Doug toys. IntelliGent soaked it in. This interest has lead to some amazing refrigerator and dishwasher art. Don't miss the letter symmetry on the red and green lines. By his second birthday, IntelliGent knew all his letters and most of their sounds. He's still a ways away from reading Dr. Dad's concordance, but he's happily enjoying the journey.